Create new, save, revert, delete, close and reopen a warehouse. 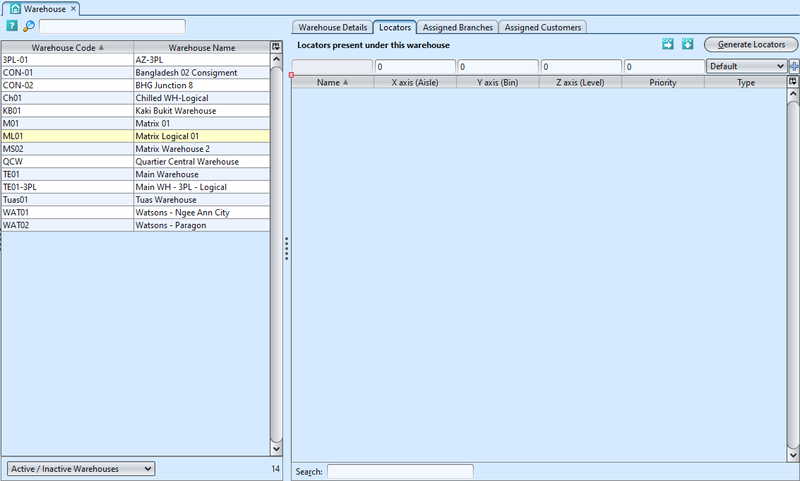 Create new, edit and delete the location in the racks; to help more efficiently locate products. 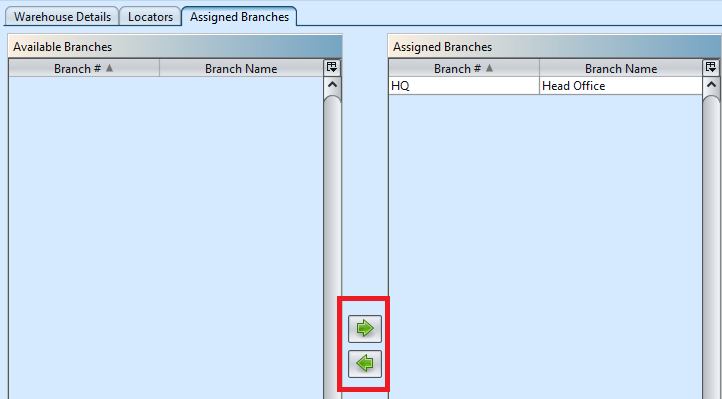 The “Assigned Branches” tab allow the user to assign branch (i.e. stores or sister companies) to a warehouse for separate branch’s access / operation. 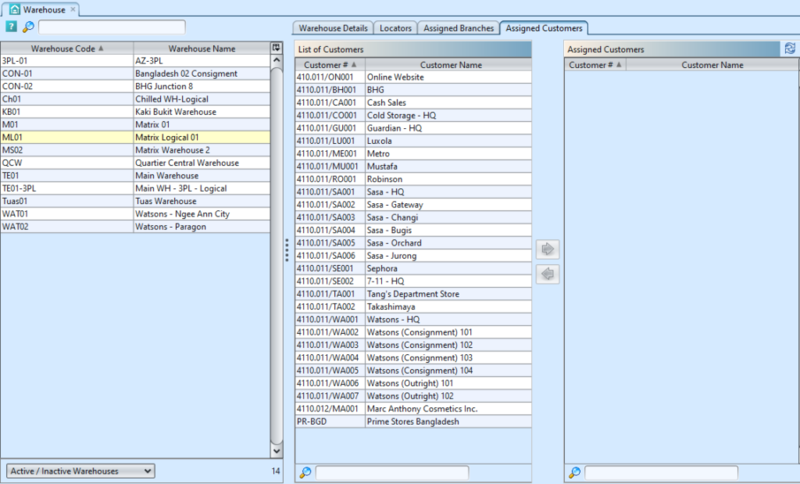 The “Assigned Customers” tab allow the user to assign customer(s) to consignment warehouse for consignment related transactions. 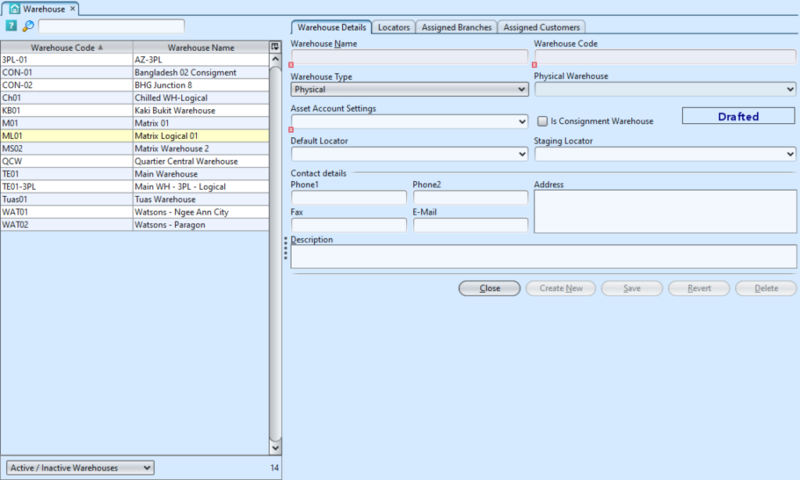 Note: user must assign at least one customer for consignment warehouse type, before they are able to save the warehouse master record (see step #4 below). 4. 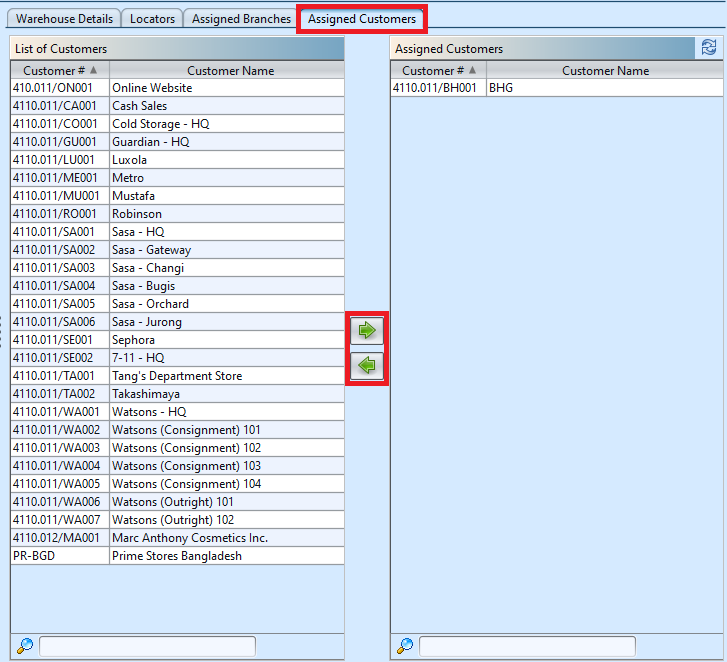 On “Assigned Customers” tab, to assign a customer to the warehouse, select available customer from the bottom left table list and click ” ” button in middle of screen. 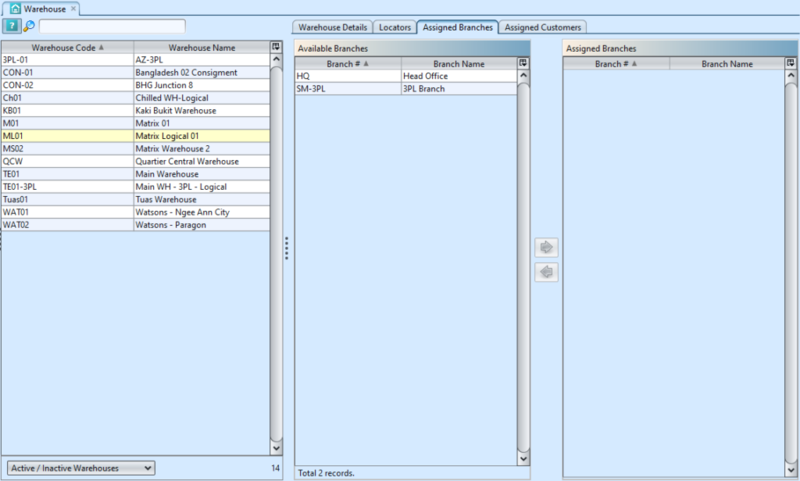 In consignment related transactions, like Consignment Order and Store Sales, system will filter to show only consignment warehouse(s) assigned to the customer (plus non-consignment warehouses). 5. Click “Save” button at the right side of screen when done, it will automatically generate default locator and staging locator. 6. Click the “Locators” tab, enter the locator’s info and click ” ” button or “Enter” to add the information. 7. Click the ” ” button, enter the prefix and number of locators to generate in the pop up window, click “OK” in order to generate the locator(s). 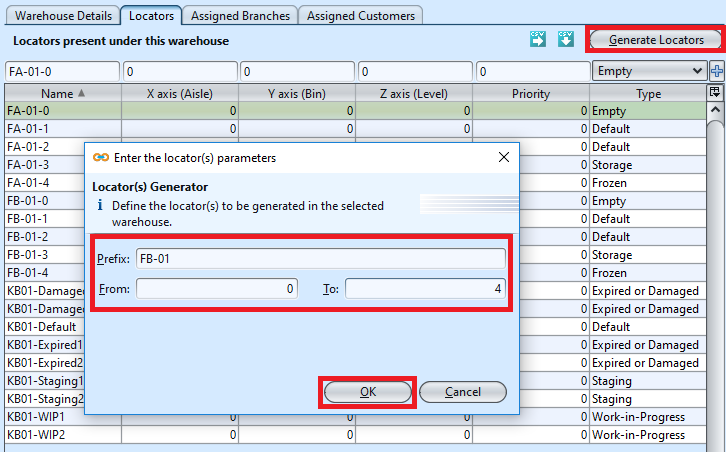 Alternatively, user can import the warehouse locators data by using “import locators from csv file” feature. Use “export locators to csv file” feature to export sample file to be use as the import template. Note: user must assign at least one customer if they are changing the warehouse type to consignment warehouse. User able to close a warehouse to deactivate / suspend it from being use in transactions. To close a warehouse, it must not have any stock present in the warehouse. User able to reopen the warehouse to use it again. 3. Click on “Yes” button on the pop-up window to confirm warehouse closing. This will deactivate the warehouse. NOTE: if user tries to close a warehouse which still have stock present inside, system will trigger error message to remind user to clear the existing stock from the warehouse first before deactivating it. 5. Click on “Yes” button on the pop-up window to confirm warehouse reopening. This will re-activate the warehouse. 1. Enter search parameter to filter the result, i.e. 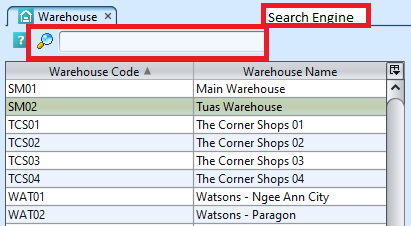 type in the warehouse name in the search textfield box at the top of the screen. 2. Click on warehouse to view, it will bring up the details on the right side of the screen. 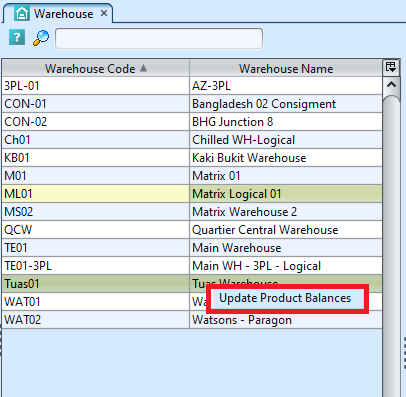 After Stock Import was completed for the warehouse, user will need to update opening balances for the warehouse, to update the opening quantity and values in some of the inventory reports. 1. Open “Inventory – Warehouse (Master)”. 2. Right-click on the warehouse (of the completed Stock Import) from the list of warehouse on the left, and select option “Update Product Balances” for the warehouse.